Allergies may not be the most significant thing in the world, but it can be quite a mood killer for those suffering, a number that is about as high as the amount of pollen in their eyes. According to the Centers for Disease Control and Prevention (CDC), more than 50 million Americans suffer from allergies each year. Spring allergies cause symptoms like sneezing, coughing and itching. Some allergy sufferers sneezes and red eyes are so bad, one could argue that allergy season is the beginning of the 5 stages of grief: denial that the pollen takeover is on its way; anger that you didn’t take your allergy medicine in time; bargaining with Mother Nature to just ease up and you’ll plant some flowers in return; depression because your watering eyes make you cry, which makes them water more; and acceptance, which typically only happens during the last week of allergy season. An allergy occurs when the immune system sees something on their block and goes “I reckon this town ain’t big enough for the both of us”and go “pow pow, bang bang”. 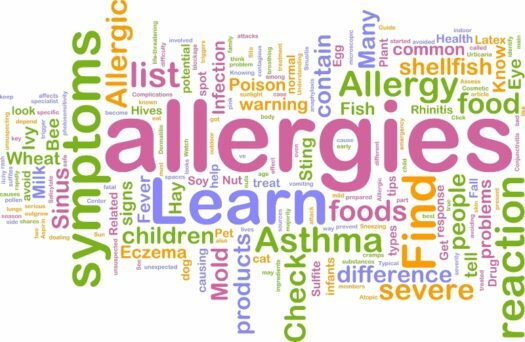 The substances that cause allergic reactions are allergens. When someone has allergies, their immune system makes an antibody called immunoglobulin, or in other words (immune goblin). These antibodies respond to allergens. The symptoms that result are an allergic reaction. For some, allergies have a domino effect of embarrassing reactions. “I sneeze so hard I fart,” explained junior Steven Morales, who suffers from intense allergies. He claims this happens often. In the spring, tree and flower pollen are the problem, while Summer just sprinkles in their pollen of death onto the grass when it’s growing– how fun! All of these can cause red, itchy eyes that also burn and sting. For some people living in warm areas, this can happen for as many as 10 months out of the year. Imagine having all these symptoms together, that just makes everything seem miserable. How do you survive a day having a headache, a runny nose, and itchy eyes all at the same time ? Whoever can survive such penalties are a true warrior. But one does not become the warrior if he or she haven’t gone through the worse allergy, the Food allergy. Who wants to be allergic to food? Ain’t nobody got time for that! Food is what keeps humans going and to be allergic to certain types of foods is already a loss at hand. Can you imagine dying because of a peanut, something that doesn’t even fight back. How terrible would it be to have everything all at once, that’s just a recipe for a living hell. Allergies, why must you do this to us every year?